Have you ever been told fats are bad? Do you avoid fats in hope to lose weight? Did you know, losing weight is the #1 resolution set each year? This article is meant to debunk myths about fats and reveal the truth of their need in our daily lifestyle. Myth 1: Fats will make me fat! Truth 1: Without realizing it, our bodies are full of fat (the good kind). No, don’t look at your thighs or your husband’s belly (you are both beautiful the way you are!!) but I want you to look beyond that.
? Did you know, the average human body contains about 37.2 trillion cells. These cells contain a nucleus in the center and that nucleus contains our DNA, which all together make up who we are! Each cell contains a membrane that holds the nucleus inside. These membranes are partially made up of fat to keep them flexible to allow nutrients in and garbage out. Without fat, cells become rigid and slow to function rendering them useless.
? Did you know, your brain is 60-70% saturated fat and roughly 25% cholesterol. Fats are one of the ways our brain obtains the nutrients and energy it needs to function properly. Our liver turns fats to ketones and they can be transported to the brain for optimal brain power!
? Did you know, fats carry vitamins and nutrients throughout the body for use. Some essential antioxidants require fat to dissolve. Vitamin E, one of the king antioxidants, requires fat to metabolize, but also (my favorite part) is that Vitamin E protects fats from being damaged. Helps avoid turning “brown” like guacamole left out after it has been whipped up. Our bodies utilize fats in so many ways that we need in order to function properly. Fats will not make you fat! Unfortunately, fats received the blame but sugar is really the culprit for making us gain an extra pound or two in places we didn’t want. Myth 2: Fats will raise my cholesterol levels! Truth 2: Back in the 1960’s, the sugar industry paid off scientists thousands of dollars to publish research stating fats were to blame for the rise in obesity and ultimately the rise in cholesterol (NY Times article). The government took with this news and ran before other scientists could back up the data. Senator George McGovern announced the Low-Fat Guidelines in the 1980’s, which spread like wildfire, but sent the health as a population on a steady decline. There are now countless published research articles that show eating a low fat diet is very detrimental to our health and that sugar is actually the leading cause of obesity, Type II diabetes, heart disease, and other modern diseases (see why here). We need fats in our body to function properly while also minimizing our sugar intake for best results. Myth 3: Fats will ruin my diet and make me unhealthy! Truth 3: False! Fats can actually add more variety to your diet and enhance the flavors of your food. Ever add coconut oil to your protein pancakes or cooked your vegetables in avocado oil? Great way to add some fats without thinking about it. One half of an avocado has roughly 10 grams of fat and ½ cup of 4% small curd cottage cheese has around 5 grams of fat. Throw both of those in a salad with some olive oil (1 tablespoon = 14g fat) as a dressing and that right there is a very healthy meal! Myth 4: Fats are all bad! Truth 4: Fats come in all shapes and sizes. Luckily, they are not all made the same either! When products are organic, they contain many more nutrients than if they were not. Make sure they are non-GMO if organic is not available. As you begin to get closer to the conventional production of fats, they contain less and less amounts of nutrients that our bodies rely heavily on and they contain more harmful substances like pesticides. The less a product has been processed, they better they are for us as well. Compare the yolk of an egg to ice cream. Both are full of fats, but one has been processed and had loads of sugar added while the other is found in its natural state. Whole fat ice cream is not bad every once in a great while but let’s focus our attention on the healthier fats for our bodies like the yolk of an egg! Caution does need to be exercised when dealing with trans fat and processed vegetable oils. These fats are not beneficial to our bodies in anyway and can actually wreck havoc on our tissues. As oils become processed and hydrogenated, they become damaged and unstable, then cause damage to our bodies after we eat them. To avoid this potential damage, it is good to avoid trans fats and stick to oils that can be pressed (i.e. coconut and olive oils) instead of processed. Myth 5: Fats only come from animal products and I am vegetarian/vegan! Truth 5: Have no fear, there are many available fats for everyone. Yes, animal products can carry a lot of fats, especially if it is a whole milk dairy product. There are many other options out there for anyone no matter their lifestyle preferences. 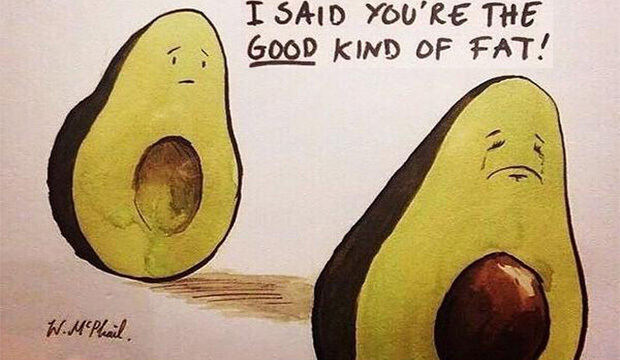 Avocado’s are the highest in fat ratio with 77% of its calories attributed to fats. Dark chocolate is vegan friendly since there is no dairy added to it. Pick a dark chocolate higher in cacao percentages (at least 65%) because the higher percent it has,the more nutrients it has and the less sugar it contains (100% – 70% cacao = 30% sugar). Cacao is full of polyphenols and antioxidants amongst many minerals. Depending on what type of vegetarian you are (aka pescitarian) fish has a large amount of fats. Omega 3 fats help support inflammation levels in the body and supplements typically come from a fish source. Chia seeds! These are not typically considered a fatty food but they are great to add to smoothies, oatmeal, or protein balls (click to find recipes). Per 1 oz of chia seeds, they contain about 9 grams of fats. MCT oil. Now this derives from coconut oil or palm oil, but we want to focus primarily on MCT oil coming from coconuts. MCT stands for Medium Chain Triglycerides and they are the healthy fats that our body utilizes the best. Using regular coconut oil will provide these medium chains but not in the quantity that MCT oil can provide. MCT oil can be used in coffee, tea, smoothies, and anything else your heart desires. Overall, fats are very beneficial to the body and should be incorporated daily in our foods. There are many easy and delicious ways to add fats at each meal. Once it becomes a regular routine, you just may notice improvement in skin, nails, weight, digestion, and even energy!